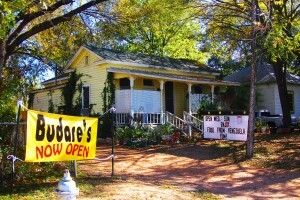 The front house of Budare’s Venezuelan food trailer on Rainey Street in Austin Texas. As you walk down the little driveway on the left side of the picture a small courtyard appears wherein a food cart is set up vending Venezuelan cuisine. Looks promising. This entry was posted in FOOD, The Foodist and tagged Austin, Texas Daily Photo. Bookmark the permalink.